It is so easy to use an appliance and not think to clean it too, when was the last time you cleaned your dishwasher? It is really easy to clean your dishwasher! Often, the only time we notice it needs a clean is when it stops working. However, if you took the time to clean it regularly this maintenance becomes easier to manage. How often you clean your dishwasher will depend on your own circumstances, I like to thoroughly clean mine at least once a month! A dishwasher starts to smell because there is a build-up of bacteria that is causing the unpleasant smell. This is just food debris that has built up and is causing the odour! It is time to clean your dishwasher! The best way to clean a dishwasher is simple, follow the instructions in your manufacturer’s handbook! It really isn’t difficult, the more frequently you clean the less chance of bacteria growing and covering your plates and dishes instead of making them clean and your dishwasher won’t smell! The first thing you must do is read your manufacturer’s instructions on how to clean your dishwasher, if you ignore these you might damage your appliance and then it is not going to clean any dishes! I like to remove the trays so I can get access to the bottom of the dishwasher, I wipe these over too as they are prone to a build-up of debris too, especially the cutlery holder! Wipe down the bottom of the dishwasher with a damp cloth and remove any particles of food. I repeat this process until all food and grease is removed. Following manufacturer’s instructions remove the filter and clean. Mine I empty any waste particles and wash thoroughly to ensure that there are no particles trapped in the filter. I then put the appliance back together and put the dishwasher through a cleaning cycle with a commercially purchased dishwasher cleaner! This must be on a hot cycle to kill all the bacteria in the machine. Why I don’t make a cleaner is purely convenience! However, this is something I am seriously thinking about, if a commercially produced cleaner works better than a homemade cleaner? Dishwasher cleaner commercially produced available in a lot of places! I personal use the Aldi’s own brand but it is similar to this dishwasher cleaner! White Vinegar, which is available in most places where cleaning products are sold, you can purchases it online too! Cleaning cloths or disposable wipes, if you are using disposable wipes make sure you are putting them into a bin and they are cost effective for you! If you are looking for a printable cleaning pack that will help you tackle your cleaning, check out this printable cleaning pack I’ve put together just for you! When doing any sort of cleaning, it is a great idea to protect your hands from chemicals, these dry out and damage your skin. Cleaning doesn’t mean that you can’t take care of your hands too! I always put something on the floor to protect the floor from splashes! I just use an old towel, it means I don’t have to wipe the floor afterward if there is a spillage and the towel is easily washed with the rest of my cleaning rags! There are some alternatives to using a purchased machine cleaner. Some people recommend a dishwasher-safe container full of white vinegar. However, this might damage some interiors so always check with the manufacturer first. A bicarbonate paste mixed with water and a dash of washing up liquid will help to remove stubborn stains on the inside of your dishwasher! There is one area that is so often forgotten when cleaning a dishwasher and that is the door. This is often splashed with food and liquid and keeping this clean will ensure that the appliance looks clean when you open the door! I like to clean the outside of the dishwasher about once a week, I will give it a rub down to remove any dust or dirt from the outside to make it look clean and presentable! I don’t pull out the dishwasher more than every three months to give the top and the sides a clean. It is amazing how much dust gets on top of these appliances! If yours is a built-in machine you won’t need to pull it out to clean! When it comes to the dishwashing tablets or powder, I’m all for the basic 3 in 1 that Aldi sells, however, I’ve been thinking about the options for making my own tablets. I want to know if they would work better and if they cost less to make than buying factory made products? My concern is not knowing what is in the factory made options and if they are cleaning sufficient without leaving chemicals on my kitchenware? I’m not a chemist and the label really doesn’t mean much to me! I’ve no knowledge as to what dishwasher cleaning products should contain and what I need to avoid! I also hate to waste my time on something fiddly that doesn’t work, this is why I want to find out if making your own dishwasher tablets are worth time and money or if they are best left alone! I’m going to look at the practicality of homemade dishwashing tablets! 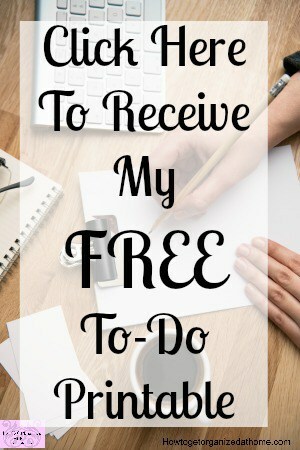 I want to do what is easy and cost effective but it has to work too! You can find out here what homemade dishwashing tablet recipes I’ve found and the 3 that I’m going to try to make! I want to work out what is best for my wallet and my dishwasher, I’m going to look at both options and work out which is more cost-effective in getting your dishwasher clean? Is it the factory made all-in-one dishwasher cleaner or does cleaning it with a homemade cleaner better? I’ve been using a purchased cleaner, purely for convenience, however, I’m not convinced that this is cost effective. I also am unaware of what is in this product and if there are chemicals in there that I would rather not have in my dishwasher! I also have another concern, the containers the liquid comes in is a one-use piece of plastic, yes, I recycle it but is there a better way that reduces the need for more plastic that potentially ends up in a landfill site, or worse, in our oceans? I love the convenience of the one use dishwasher cleaners, but I’m starting to question the cost to the planet as well as to myself and family! Because of the design of dishwashers, there is the potential to get a blockage or a build-up of particles in the waste removing outlet pipe. If you have some technical skills flushing this out isn’t difficult, following your manufacturer’s guidelines of course. However, if you have an appliance care package this might be covered in the care of the product! If you have standing water in the bottom of your dishwasher, this waste pipe is one of the first things you need to clean. This pooling of water will make your dishwasher smell, so dealing with it as soon as possible is so important! 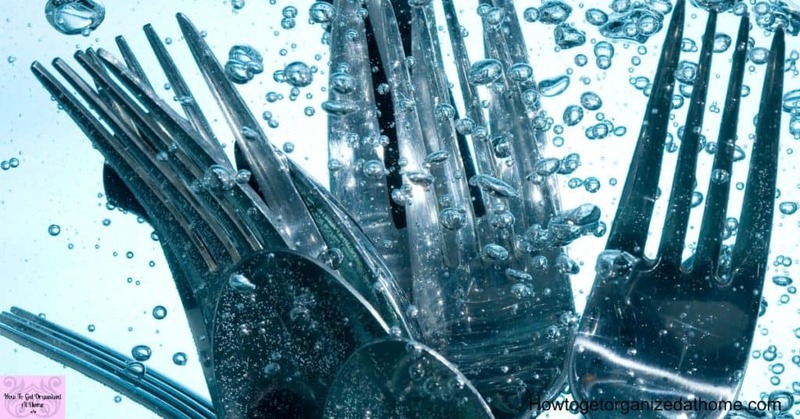 The fewer food particles that you put into your dishwasher, the less you will have to clean out! We don’t have a waste disposal system in the kitchen, it’s not something that is very big in the UK, so it’s not something I’ve thought about. So, I have to ensure that I’m not putting this waste down the drain either! By keeping these particles of food out of your dishwasher and drain you are reducing the potential of a food blockage in your waste pipe! These types of blockages smell, they can really start to make a dishwasher an unpleasant area, but along with the smell you are building up bacteria and this could end up on your plates and cutlery, making you and your family poorly! I have been asked why clean it, after all, it is cleaning the dishes isn’t this enough? The simple answer is no. Unfortunately, you need to clean the inside of your dishwasher regularly for it to perform at its best and to ensure that it is working correctly. It’s part of the process of having a dishwasher, you have to take care of it, or it won’t do the job it was made todo! 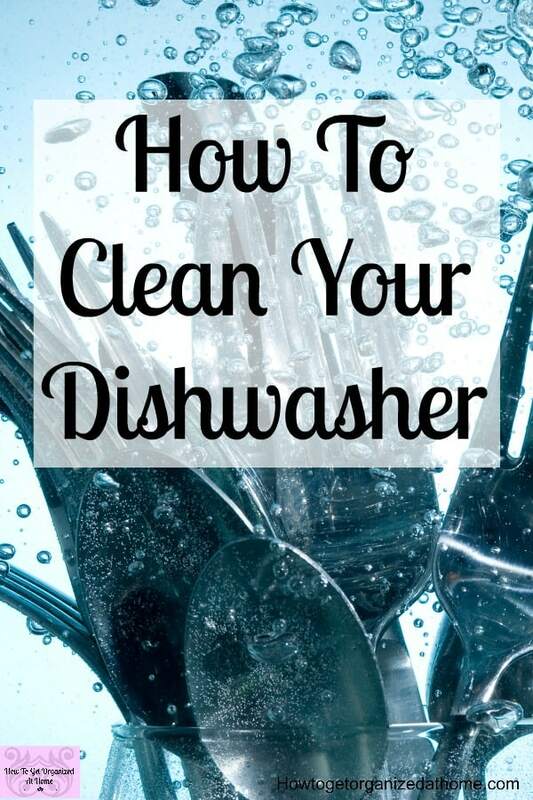 Therefore, if you have a dishwasher you must consider cleaning it frequently to ensure that it is working to its best and not just covering your plates in dirty and bacteria-ridden water. A clean dishwasher will perform better than a dirty one! 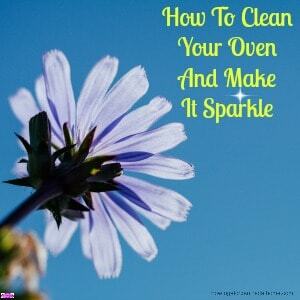 Looking for cleaning products for your dishwasher? One (vaguely related) tip here: Before we finally convinced Samsung to replace the control board in our almost new dishwasher, we had many visits from their local warranty service provider. He told us never to use dishwashing tabs. Many dishwashers don’t get the water hot enough to completely dissolve the tabs, leaving bits and pieces to clog the drain system. Another tip: don’t buy anything from Samsung, who have the worst customer service department I can remember. We washed dishes by hand for seven weeks before they at long last authorized the repair the service guy wanted to make from Day One. Hi Sharon, your tips work perfectly fine for my dishwasher. Cooking has always been my passion since I was little and dishwasher has been my perfect partner since then as I constantly need the help of dishwasher to clean all the utensils, dishes, etc that I use. However, I seldom have time to clean my dishwasher especially when I’m constantly using it. With your tips, I can now easily clean my dishwasher on a regular basis. Thank you for your kind words! 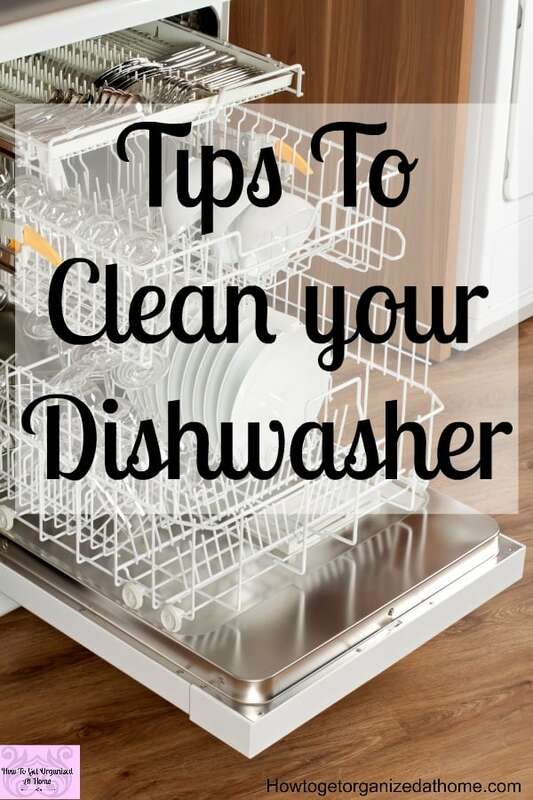 🙂 I am glad my tips will help to keep your dishwasher clean!